Michelle Hynes returned to Encore.org in January 2018 after four years as an independent consultant and career coach. From 2003-2013, she held key leadership roles in three signature Encore.org initiatives — Experience Corps (now AARP Experience Corps), The Purpose Prize®, and the organization’s annual convening for encore leaders. During her 20+ years in the nonprofit sector, she has designed, developed, raised money for, evaluated, and written about programs focused on children’s literacy, youth development, high school graduation rates, community involvement in schools, and career transitions. She is the co-author of the 2014 publication The Role of National Service in Closing the Graduation Gap. 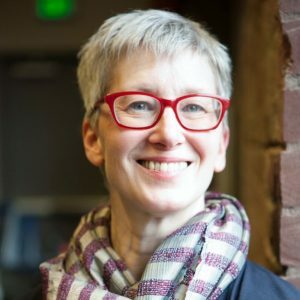 In addition to her work at Encore.org, Michelle co-chairs the grantmaking process for a women’s giving collective in Portland, OR. She holds a Master’s in Education from University of Pennsylvania, a certificate from the Stanford University Executive Program for Nonprofit Leaders, and a coaching certification from New Ventures West.